"reWealth is the secret weapon of responsible redevelopers, successful real estate investors, and effective community leaders." "This is the book world leaders should be talking about! ...they will find the path to revitalizing our economy, restoring our environment, and renewing the quality of our lives. "All national politicians and community leaders should be forced to read reWealth." 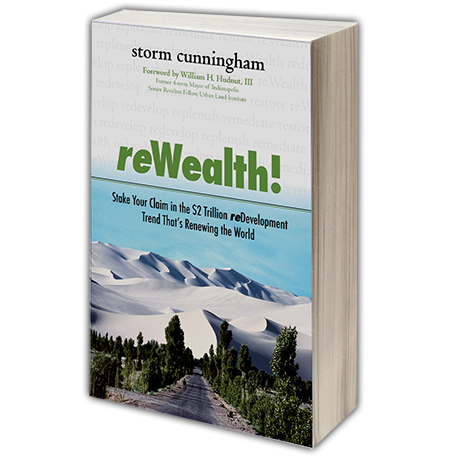 "Revitalization guru Storm Cunningham's new book contains your future. I was hooked by the time I'd finished the Introduction." "Every business and government executive in the world needs to read this book twice! Absolutely brilliant..."
- Eric Garland, CEO, Competitive Futures, Inc., and author of Future, Inc.
Storm Cunningham's revolutionary 2008 book, reWealth, is available from McGraw-Hill. It's the guide for sustainable, green revitalization: attracting investment to distressed communities, and creating successful public-private partnerships for regenerative growth. If you're an entrepreneur, investor, professional, or a community leader, this book can help you thrive in these tough economic times. Discover how to restore our world for a living...as a labor of love, or for profit. The Foreword is by William Hudnut, III, former 4-term Mayor of Indianapolis, and Senior Resident Fellow at the Urban Land Institute. reWealth! can be purchased in hardcover or Kindle at all fine bookstores worldwide, and is available from most online booksellers. Storm's third book is coming in 2019! RECONOMICS: The Path to Resilient Prosperity. Join 26,000+ following Storm on Twitter. Connect with Storm on Facebook. 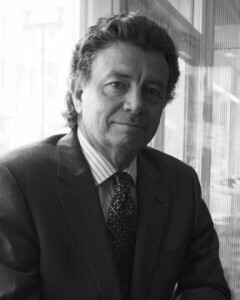 Please click here to view the biography on Storm Cunningham’s public speaking website. Storm is a redevelopment policy advisor and the Publisher of REVITALIZATION: The Journal of Urban, Rural & Environmental Resilience. 2) how to strategically position their career, or their organization, within that process. @ Copyright 2008-2019, Storm Cunningham.